The mission of SHAL is to provide shelter, case management and associated services for homeless people in support of their efforts to become self-sufficient. SHAL is committed to improving the quality of life for all members of our community. SHAL, the Southernmost Homeless Assistance League, Inc., is a non-profit organization incorporated under the laws of Florida. 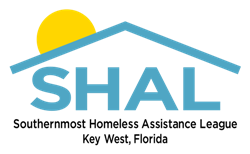 SHAL Shelter Services operates KOTS, the Keys Overnight Temporary Shelter, the only low-demand emergency adult shelter in the Keys. SHAL Outreach provides individual case management for sheltered and unsheltered homeless persons in Key West and Monroe County. SHAL provides community education where staff and board members work with local groups and leaders to better understand homeless issues in our community. Monroe County Board of County Commissioners: Human Services Advisory Board. And generous private donors like you! Please enjoy this amusing and informative six minute clip from the Daily Show in 2015 in which correspondent Hasan Minhaj reports on the disappearance of homeless people in Utah.